Chevron is deeply involved with natural gas projects in both Australia and New Zealand. Maritime Union of Australia (MUA) members say they’ve been treated unfairly at Chevron’s massive Gorgon project, located off the country’s northwest shore. Chevron intends to collect gas from offshore wells then liquefy the product on Barrow’s Island for export using giant LNG tankers. The effort was first estimated to cost $37 billion but exploded to $54 billion because of cost overruns. In May 2015, docker union leaders from around the world met in Perth, Australia for a strategy meeting that included a protest against Chevron for failing to respect workers’ rights in Western Australia. Autralian and New Zealand's trade unions joint in a protest (called by the Maritime Union of New Zealand (MUNZ) and International Transport Workers' Federation (ITF)) to alert the New Zealand public to the poor practices of Chevron, that have led to major disputes in the Australian offshore oil and gas industry and around the world. 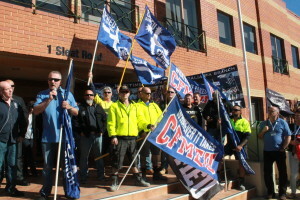 According to the trade unions, instead of cooperating with the Maritime Union of Australia (MUA), Chevron has refused to respect longstanding union contract standards and filed a $20 million lawsuit against MUA members over a health and safety dispute. The Maritime Union of New Zealand (MUNZ) presented a letter to New Zealand consulate officials to explain workers' concerns about Chevron. “We support responsible drilling with high safety standards, but we don’t support companies that have an antiworker agenda and bad environmental record.” said its president . The unions are also demanding multinational mining companies like Chevron end the practise of importing cheap labour under temporary working visas. Despite the mobilization the project went on. In December 2015, Chevron signed a non-binding agreement with China Huadian Green Energy for the delivery of up to 1 million metric tons of LNG per year over 10 years, starting in 2020. China is expected to become the largest importer of energy in the world by 2035. The LNG move for Chevron comes as energy companies are on the decline because energy prices are lower in an oversupplied market. The company reported a loss of $588 million for the fourth quarter, compared with year-on-year earnings of $3.5 billion . The Asutralian government is full swing supporting the expansion of the gas sector. In April 2016, the Prime Minister Malcolm Turnbull opened the LNG 18 Conference in Perth; he touched on topics from the jobs that the LNG boom created across Australia to the role the Trans Pacific Partnership will play in the global energy market. Mr Turnbull made sure to point out the important role gas has to play in a clean energy future. Here are his words: “Gas, which can produce 50 per cent less emissions than a typical coal-fired power plant, has a pivotal role to play in delivering energy with lower carbon emissions, making it a key contributor to global carbon abatement. It is also critical fuel stock for peak energy demand,” “We need to support the transition to renewables by providing peaking power and fill the gap from intermittent renewables when the sun is not shining or the wind is not blowing. “It is all part of our broader aim to ensure our energy security into the future." . Why? Explain briefly. Australia has gone full swing into expansion of the gas sector, which is dominated by large energy multinationals and locked in free trade agreements. Changing this pattern of the energy model is becoming tougher, and it's quite unlikely that under this model labour rights will be respected. ILWU protest, May 12 in Perth ILWU International President Robert McEllrath joined a protest against Chevron on May 12 in Perth, Australia. ILWU International President Robert McEllrath joined a protest against Chevron on May 12 in Perth, Australia.